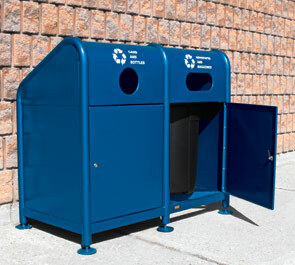 Configured as single, double or triple unit recycling stations, these products provide a convenient and secure way to be environmentally friendly. Rugged tubular and sheet steel construction keep recyclable materials safely out of sight behind durable locking panels. Three different slot types and bold labeling graphics identify intended bin contents and internal steel funnels guide waste materials into their respective Polyethylene Liners. The large capacity liners are easily removed to make emptying liners hassle free, and heavy-duty leveling feet allow the bins to be permanently and securely anchored. Available in Single, Double or Triple Units. 16 Gauge Sheet Metal Panels. 12 Gauge Door Latch Plate.